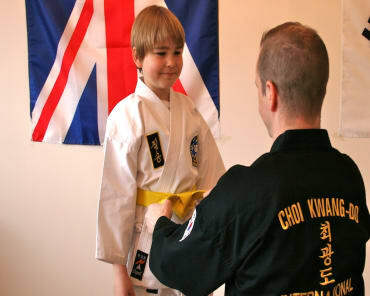 Choi Kwang Do was developed by Grandmaster 'Kwang Jo Choi' between 1978 and 1987 and is now celebrating it's 30th year of international recognised martial arts status. Choi Kwang Do's natural, easy-to-learn, sequential movements maximize your body's force-producing capabilities, but more importantly, they increase opportunities to enhance your health. It's a unique program based on modern scientific principles from kinesiology, biomechanics and psychology. Choi Kwang Do is not designed for competition. 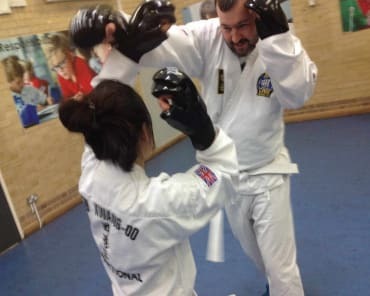 The system is meant for the average individual who wants to learn real-life, practical Self-Defence skills and achieve a greater level of health and well-being, not people solely interested in winning trophies. With competition removed, students can continually develop—not against each other, but with each other. With a progressive system from White belt to highest level of Black belt, Choi Kwang Do always offers you something new and challenging to learn, experience and enjoy. Our training at Stanley Primary School in Teddington is based on individual needs, capabilities, skill levels and age. Our students range from 4 to 90 years old, and internationally some of our instructors are over 70. Since our primary goals are to prevent or reduce illness and to promote optimum health and longevity by minimizing degeneration of body and mind, we also welcome those with limitations. Everyone is welcome to train at Clarke School of Choi Kwang Do from the Teddington, Hampton Hill, Hampton, Twickenham and Whitton area!